The Supreme Lord is not formless or impersonal. When we speak of Krishna, we speak of the Supreme Personality of Godhead. What this means, essentially, is that the Godhead, the Supreme Truth, the source of everything, is ultimately the supreme individual person. According to the Vedic literatures, God has three features. First, He has His all-pervading, impersonal aspect. In this feature, He is the great light from which everything shines forth, the great primordial truth from which all other truths arise. Beyond this, however, He also has His aspect of Paramatma, the supreme knower who lives within the heart of everyone and gives everyone knowledge, memory, or forgetfulness. And ultimately God also has an independent personal aspect, His original eternal form of bliss and knowledge. In this personal aspect, the Lord has not only a form but also a name, an abode, personal qualities, an eternal entourage, and spiritual activities. Yet all these are beyond our direct sensory perception. Through sensory perception we can neither confirm nor deny God’s existence; all we can say is that He is not within the reach of our senses. Nor can we know God merely by speculation. The mind and intelligence are limited. So if God is unlimited, our minds and intelligence will prove too small to grasp Him. But the unlimited, if He is truly unlimited, can reveal Himself and His unlimited nature, even in this material world. This is the purpose of Krishna’s appearance. As Bhagavad-gita explains, Krishna appears in this world from time to time (to favor His devotees, subdue the ungodly, and reestablish universal religious principles for the benefit of all living beings). So although Krishna is the supreme absolute, the ultimate existence, the Supreme Lord of all creation, He also appears within this mundane world as a visible, historical person. When He does so, He enlightens us by showing us His eternal nature and His eternal transcendental form. Janmashtami is what could be called Krishna’s birthday. But it’s not called that, because Krishna never takes birth like an ordinary man. An ordinary man takes birth in this world because he is forced to by the laws of nature. But Krishna’s “birth” is a transcendental drama staged by the Lord Himself. In this drama, the Lord allows certain exalted devotees to play the roles of His father and mother, and others appear as His friends and other associates. From the very beginning, Krishna’s activities on earth were extraordinary. At the time of His so-called birth, He appeared before His parents as the majestic four-armed Lord Narayana. While still a child on his mother’s lap, He slew the great demon Putana. Throughout His 125 years on earth, Krishna performed wonderful superhuman activities. He exhibited the unlimited strength, beauty, wealth, fame, knowledge, and renunciation of the Supreme Personality of Godhead. In particular, He imparted sublime spiritual knowledge to His friend and devotee Arjuna, knowledge that endures in the sacred text Bhagavad-gita. According to Bhagavad-gita, we can achieve freedom from the pangs of material suffering and return to the kingdom of God simply by understanding the transcendental birth and activities Lord Krishna enacts when He appears in this material world. Yet, the Gita goes on to say, hardly anyone knows God as He is. In the absence of a clear understanding, we describe God negatively, in terms of what He is not, or in terms vague, enigmatic, and intangible. But when God personally descends to earth. 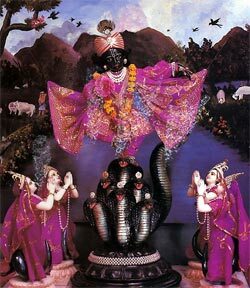 He reveals His eternal form and His eternal transcendental qualities. But even though God personally appears, one cannot understand Him merely by blunt materialistic vision. Even when Krishna was present, less intelligent men, unable to appreciate His transcendental superexcellence, thought Him an ordinary person of this material world. Similarly, unintelligent men in the present age think Krishna nothing more than a mythological hero. Yet great saints and sages throughout history have consistently accepted Lord Krishna as the Supreme Godhead. The sage Vyasadeva was the compiler of the Vedic literature and the author of Vedanta-sutra, perhaps the most demandingly logical treatise on spiritual inquiry ever written. Yet after completing Vedanta-sutra Vyasadeva felt that his life’s work would be incomplete if he failed to write one book devoted exclusively to describing the transcendental form, qualities, and pastimes of Lord Krishna. Would such a sage have suddenly abandoned his rigorous pursuit of truth to indulge in spinning whimsical mythological tales? Lord Krishna is neither mundane nor mythological, but one can understand Him only by pure devotion. Indeed, this is the central theme of Bhagavad-gita, for this is the supreme principle of religion that Lord Krishna appears in this world to teach: that one should abandon all other forms of religion and simply surrender to Him in devotion. Pure devotion to God, pure love for God, is the ultimate goal of all religious principles. From a historical point of view, Krishna appeared within this material world for 125 years and then left. But from a broader philosophical viewpoint we can understand that Krishna is always present everywhere, although sometimes He is visible and sometimes not. When Krishna descended on earth five thousand years ago, He briefly made Himself visible to all. And from the Vedic literature it is understood that those whose eyes have been anointed with the ointment of pure devotion can see Lord Krishna in their hearts perpetually. Such exalted souls, however, are very rare. How then are the rest of us to know God and develop our love for Him’? The Vedic authorities have conclusively decided that in the present age the most effective means for developing our love for God is to chant His holy names, especially as found in the Hare Krishna mantra—Hare Krishna, Hare Krishna, Krishna Krishna, Hare Hare/ Hare Rama, Hare Rama, Rama Rama, Hare Hare. Because God is absolute, there is no difference between God and God’s name. So when we chant the holy name of the Lord, the Lord Himself is dancing on our tongue. As we continue to chant—sincerely, we associate directly with the Lord, and thus we advance in spiritual life. Just as there is no difference between the Lord and His holy name, so also we cannot separate Krishna from His transcendental form. When Krishna’s form is present. Krishna Himself is present. 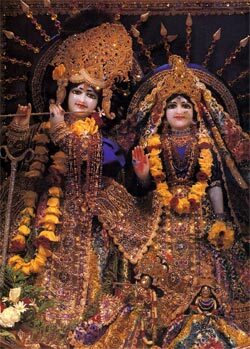 The Vedic scriptures therefore recommend that one worship Krishna’s murti,His transcendental form in the temple. 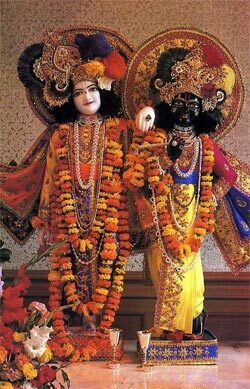 Although the murti appears to mundane eyes to be a mere statue, to the eyes of a pure devotee He appears as Krishna Himself. Of course, metal and stone and wood are material elements, but Krishna is present in these elements, for He is present everywhere. And when these elements are molded into Krishna’s form, the same Krishna who was present all along becomes visible to our eyes. 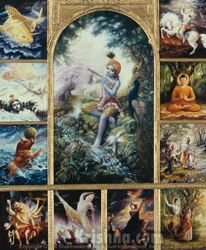 The pictures on these pages, therefore, are pictures of Krishna, the Supreme Personality of Godhead, who appears in this world for our benefit. And if we devote ourselves to Krishna and chant Lord Krishna’s holy name, under the direction of a bona fide spiritual master, our consciousness will be purified, and we will be able to perceive Krishna’s presence directly—while chanting Hare Krishna, while seeing the form of Krishna, and ultimately at every moment.